Right triangles are central to trigonometry. 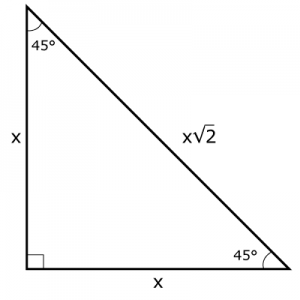 Two special right triangles appear over and over in standardized exams and homework problems. These triangles are “special” because they have simple ratios between the lengths of each side. This is an example of a special right triangle. The first is the 30-60-90 triangle. 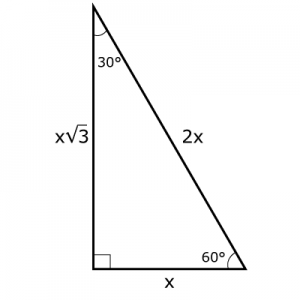 The 30-60-90 is named after the interior angles of the triangle. If the shortest side is length x, the longest side or hypotenuse is twice as long. The remaining leg of the triangle is √3 times the length of the short leg. The second special triangle is the 45-45-90 triangle. This triangle is formed by cutting a square along its diagonal. If the sides of the square are length x, the hypotenuse will be x√2. Both angles are 45º, so the trigonometric ratios are the same for both interior angles. Memorizing these values would be time well spent. These triangles will show up again and again in exams and homework. For more general right triangles, check out Right Triangle Trigonometry. Every student should know the ratios for these two special right-angled triangles. An easy way to remember them is the mnemonic “Hee, hee, hee, one, two and the square root of three” for the 30-60 triangle, and “Boo, boo, boo, the square root of two” for the 45-45 triangle.